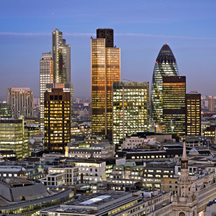 The FTSE-100 index falls sharply to a low for the year of of 5,899 down 11.9% this month as fears of a Chinese slowdown send major markets lower reducing the funds of people retiring that remain in equities and about to buy their annuities. The Chinese economy has been slowing and a recent devaluation of the currency two weeks ago increased concerns that the situation was worse than expected sending markets lower. The dow Jones index fell a staggering 1,089 points on opening, its biggest opening fall before recovering to be 588 lower for the day. 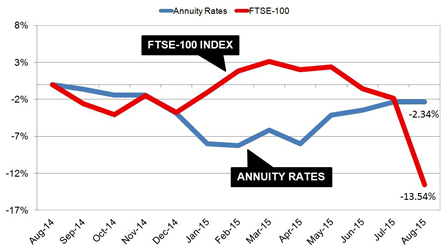 For those that remain invested and tracking the FTSE-100 index before taking their benefits either as an an annuity their fund would be lower by 11.9%. Annuity rates have been rising during the summer with our benchmark example 65 year old with a fund of £100,000 buying a single life, level annuity the income increasing by £353 pa or 6.4% to £5,847 pa.
Rates have remained 2.34% below the level this time last year while equity markets have been near their all time highs only to fall in the last few weeks to be 13.54% lower than August 2014. Most people remain invested in equities before taking their benefits and for those that track the FTSE-100 index the fall in their fund would significantly reduce their income in retirement. The above chart shows the dramatic fall in equities and for someone with a fund of £100,000 at the end of July could see their fund reduce 11.9% to £88,100 in August or for our benchmark their annuity lowering by £676 pa to £5,171 pa. In terms of lifetime income, the Office of National Statistics (ONS) would expect a male to live for 17.3 years and he will have £11,694 more over his lifetime. For a female she can expected to live for 20.4 years increasing her income by £13,790. For people caught by the sudden fall in markets they could wait for a recovery. Flexi-access drawdown would allow them to take this and leave their fund invested. This approach would mean after the maximum tax free lump sum of 25% was taken the remaining fund could be invested to benefit from a recovery. For those already invested in drawdown a smoothed growth fund would allow their fund to continue growing at 5-6% each year even though the markets have fallen. As growth in the fund is based on long term expectations, short term falls in equities can be balanced with times of above average gains producing a smoothed return over time.